Do you have an event or celebration coming up in or around the Newquay area?? Would you like to add some colour or sparkle to your party?? 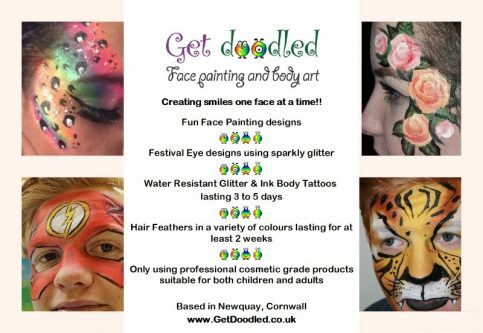 Get Doodled based in Newquay, Cornwall can help you. Please get in touch on 07588374291 or via facebook to book with the following information so I can give you a personalised quote. The type of event – Hen party, Birthday, Wedding, Engagement, ect. Is there a specific theme? – Superhero, Fantasy, Animals ect. Do you have any special requests or is there anything I should be made aware of? Is it an indoor or outdoor event – if outdoor will there be a covered area for me to set up under? Get Doodled has public liability insurance and all the products used are cosmetic grade and designed to be used on the skin. If you have any questions or are unsure of anything please buzz me on 07588374291 and I will be happy to help.